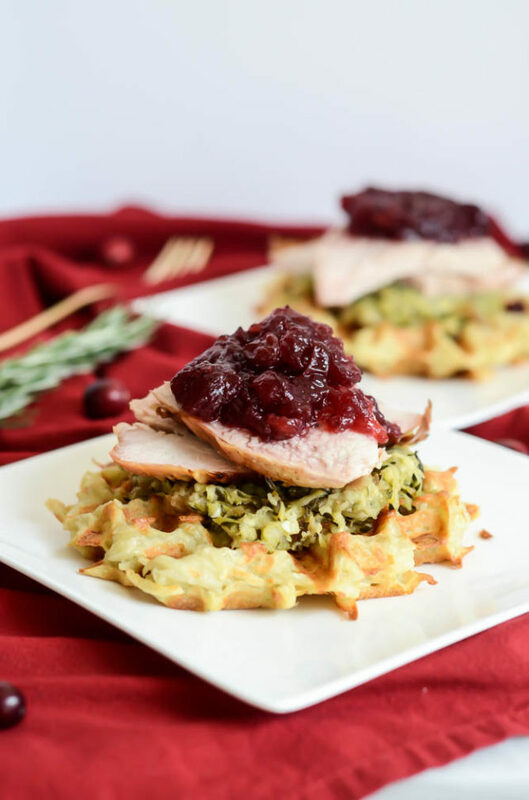 We’re talking perfectly crispy potato-laced waffles topped with all your favorite Thanksgiving fixings – juicy roast turkey, sweet and tart cranberry sauce, your favorite stuffing, even gravy if you please. 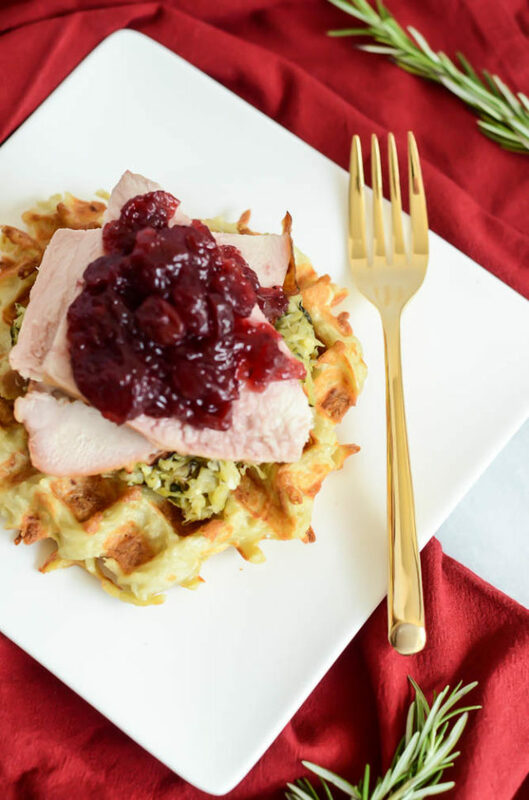 Basically all of the delicious things we look forward to for arguably the biggest food holiday of the year served up in one delicious dish that is perfectly acceptable for to be enjoyed as breakfast, lunch or dinner – Ultimate Turkey Day Leftover Waffles, your day has arrived! Well, on Friday it will have arrived, but I’m planning on taking a little break from this here blog for the long weekend so we can really enjoy our time up north with our family – and introducing everyone to our newest little addition! Plus, I figured everyone would be either (a) too busy Black Friday shopping or (b) too lazy watching football on the couch to be catching up on their favorite blogs the day after Thanksgiving, hence why I’m hitting you with my new favorite Turkey Day leftovers recipe today while we’re still craving alllll those foods and wondering what we’re going to do with the monstrous amounts of leftovers. 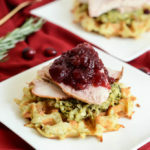 Okay, to be honest, The Ultimate Turkey Day Leftover Waffles don’t REALLY involve that much of a recipe, because they are totally customizable to whatever types of leftovers you have on hand. The one constant that I highly recommend is the potato waffles. I adapted them from Justin Chapple’s recipe for Food & Wine and they are the perfect hybrid of a typical Belgian waffle and hashbrowns/your favorite potato latke. Even better, they can easily be made in advance and frozen until ready to use, so if you know you’ll be low on cooking steam by Friday, whip some of these waffles up in the next couple of days so you can just pull them out and defrost them in the toaster or the oven as soon as you start craving that first hit of leftovers. 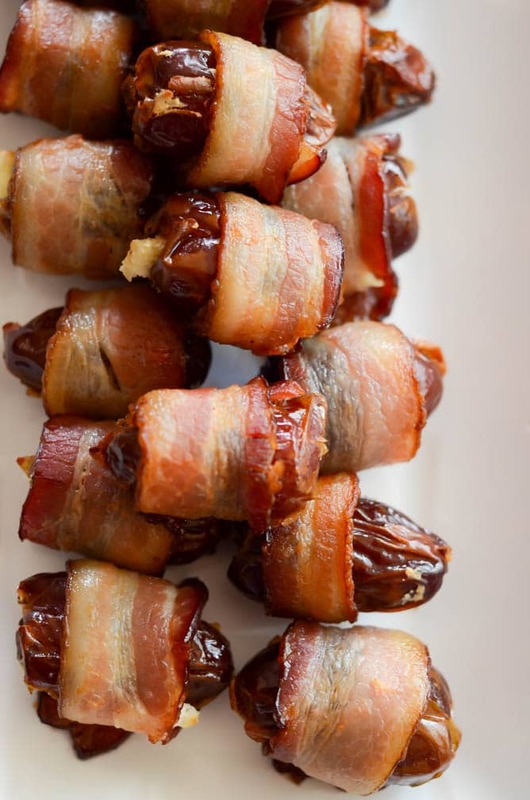 I mean, I wouldn’t even blame you if you turned to these for a late-night snack on the big day itself! After you make the waffles, you can really go in whichever direction you want as far as toppings. 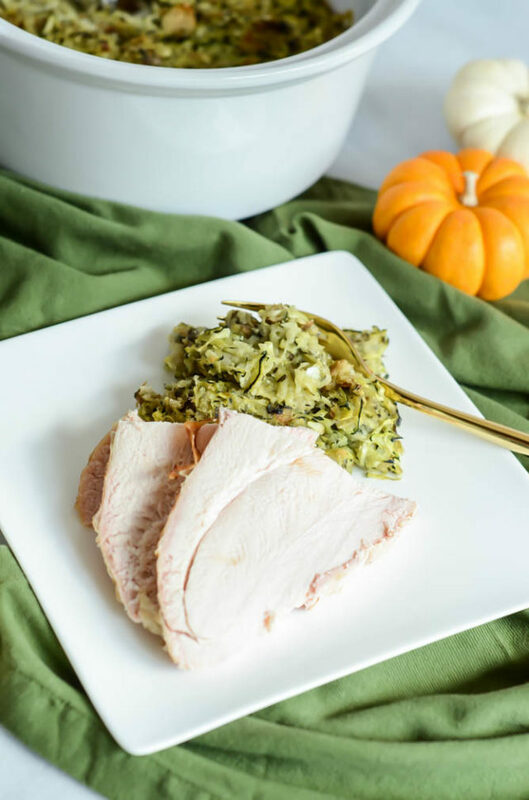 The hubs and I had a blast doing an early Thanksgiving back in September when I was working on stockpiling content for maternity leave, and I roasted up a simple turkey breast to enjoy with this Zucchini Stuffing and some simple cranberry sauce. All of these made the perfect toppings for potato-y waffles, and I’d be lying if I said I didn’t wish I’d made more of them to have ready to go this weekend. All creative license is yours! 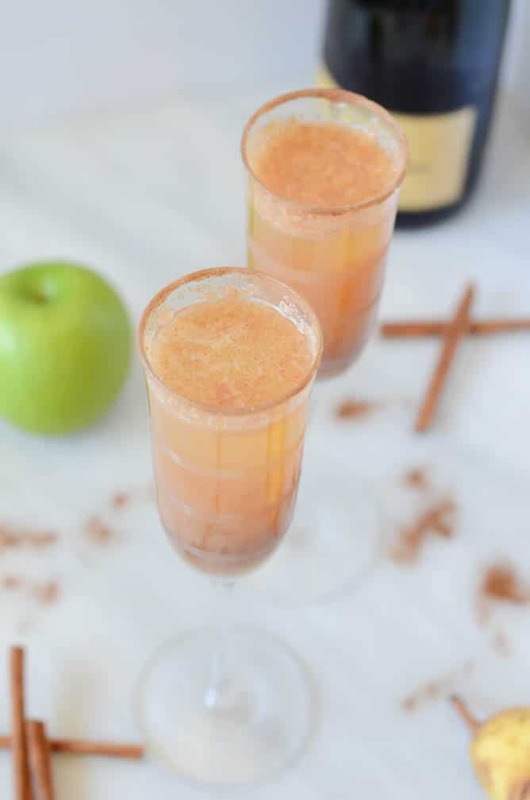 I’ll be back on Wednesday with one more fun Thanksgiving weekend cocktail to share with you all (HINT: It involves everyone’s favorite espresso drink of the season!) 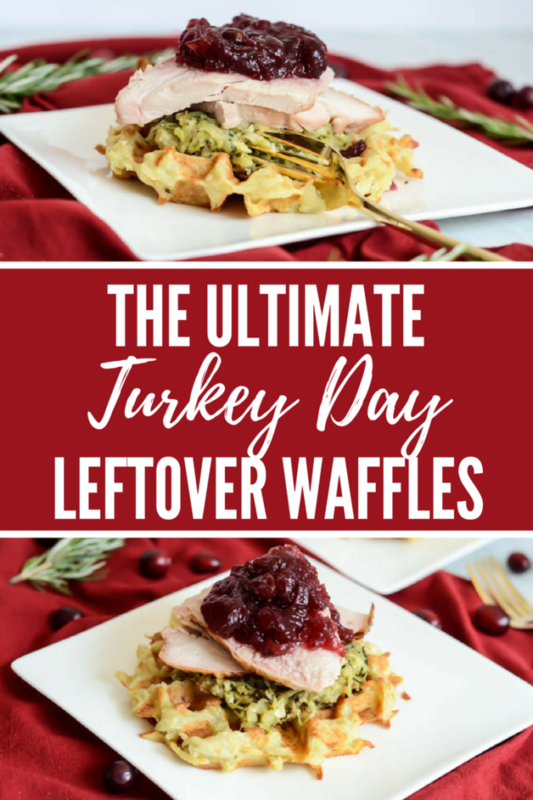 before I sign off for a few days, but until then I hope you get yourself in the kitchen and start prepping all the delicious components of The Ultimate Turkey Day Leftover Waffles! 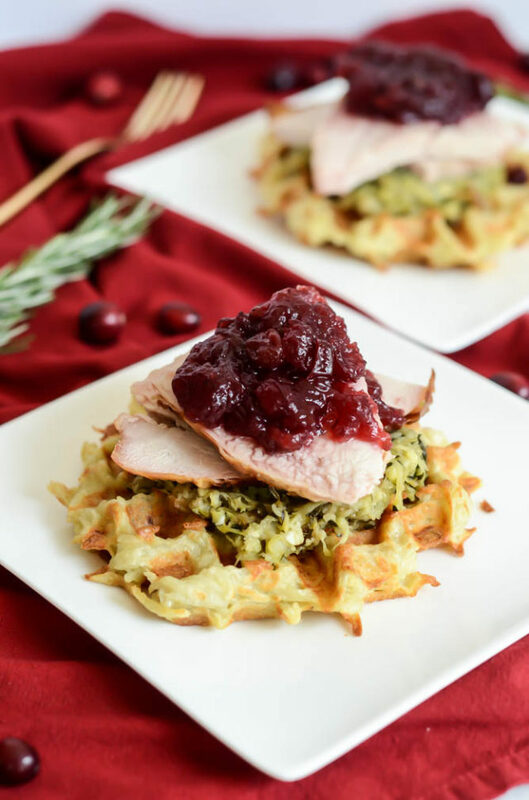 These potato-laced waffles are loaded with all of your favorite Thanksgiving leftovers - turkey, stuffing, cranberry sauce and more! Assorted Thanksgiving leftover toppings such as turkey, cranberry sauce, stuffing, gravy, casseroles, roasted vegetables, etc. Plug in a waffle iron to heat up and preheat the oven to 200 degrees Fahrenheit. Combine all ingredients except toppings in a large mixing bowl to form the waffle batter. Scoop batter into preheated waffle iron and cook according to manufacturer’s directions (about 5-7 minutes.) Once waffle is done and golden-brown, transfer it to a rack in your preheated oven to keep warm. Repeat process until all batter is used up. 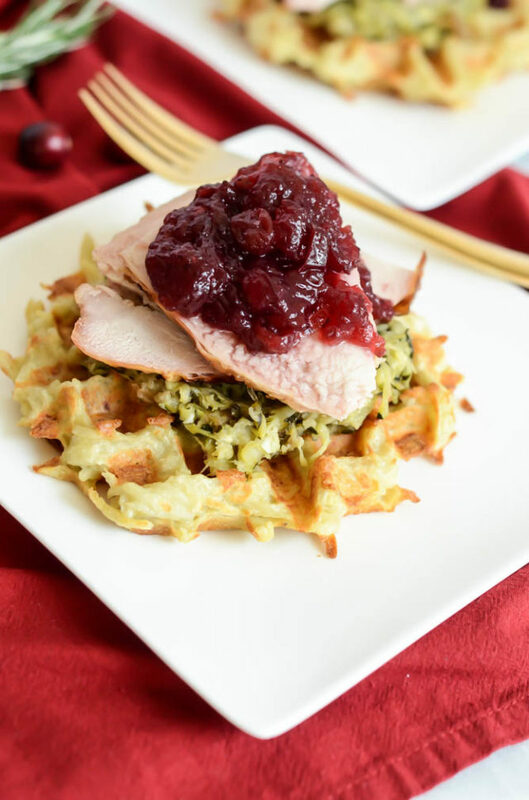 Top waffles with your favorite Thanksgiving leftovers and enjoy! Recipe adapted from Justin Chapple’s Loaded Potato Waffles recipe for Food & Wine. I hope you’re ready for a whole lot of holiday deliciousness today. 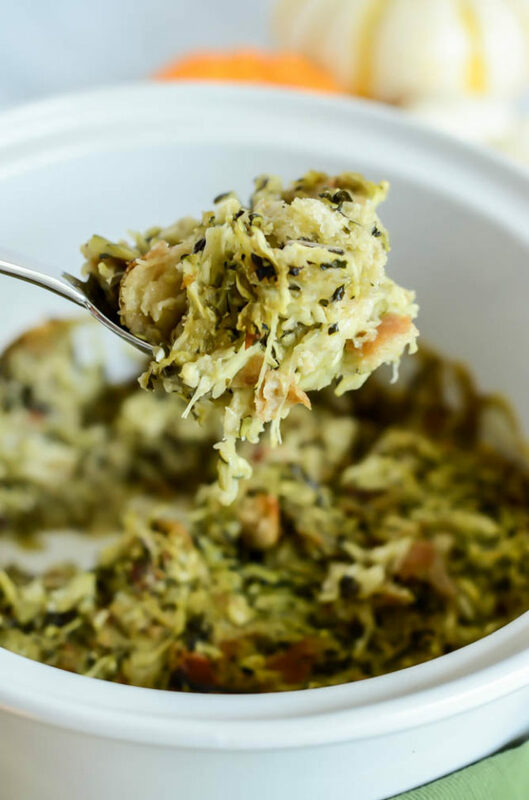 Because this is quite literally The BEST Five-Ingredient Zucchini Stuffing not only due to its insane flavor, but also because it is sooo easy to make. Yes, your holiday menus are about to change forever. 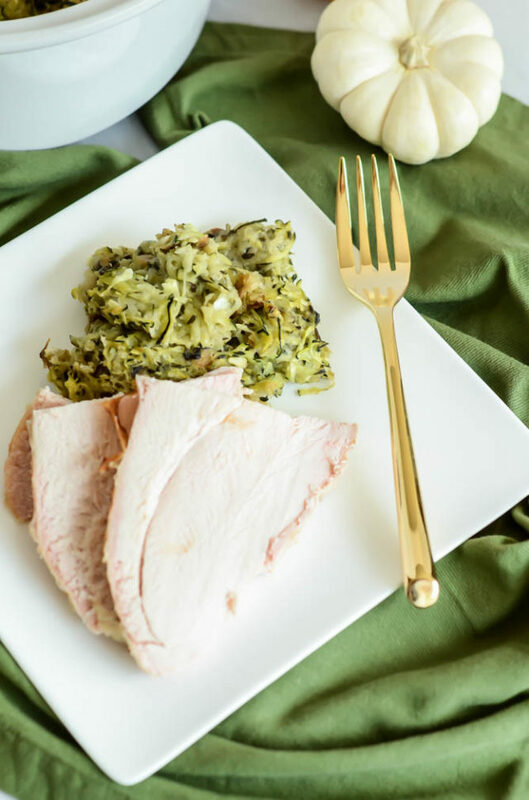 I’m letting you in on a little secret today, because this stuffing is actually a family recipe that I’ve held near and dear to my heart….until now. I’ve debated sharing it for a while, and after receiving my Dad’s blessing (he’s the mastermind behind it all) I decided there’s no time like 10 days before Thanksgiving to do it! 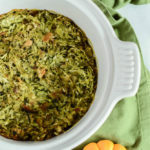 So, I bet you’re wondering what makes this The BEST Five-Ingredient Zucchini Stuffing when it only involves 5 ingredients? 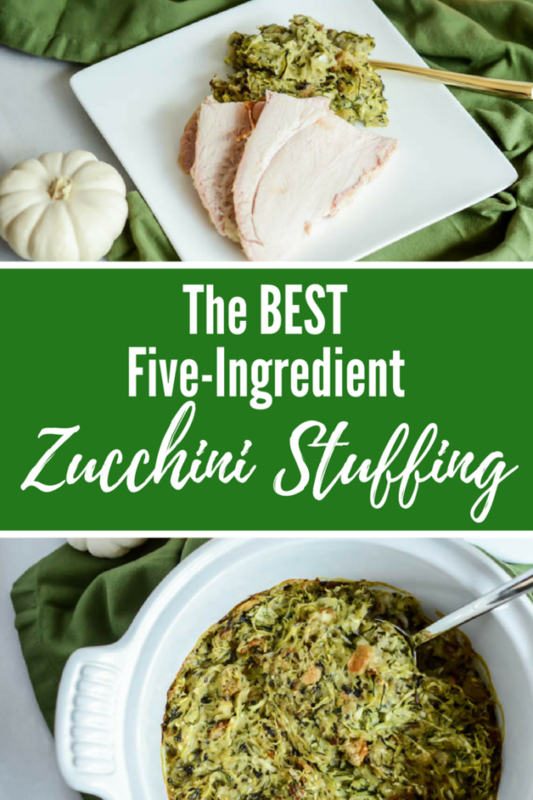 Well, let me tell you, those five ingredients are chock full of alllll the flavors and work together so perfectly that you will never regret making this your new go-to stuffing recipe for years to come. We’re talking not only the obvious zucchini (which also, BTW, makes this recipe fairly healthy as far as stuffing recipes go) but also fresh basil and plenty of garlic. Of course we also mix in some breadcrumbs and tie it all together with some high-quality butter. Have I won you over yet? What if I told you this stuffing is perfectly safe to eat raw (if you just can’t wait until you bake it off to try it) AND you don’t even have to stuff it into any sort of bird to enjoy it in all its glory? That’s my kind of stuffing. 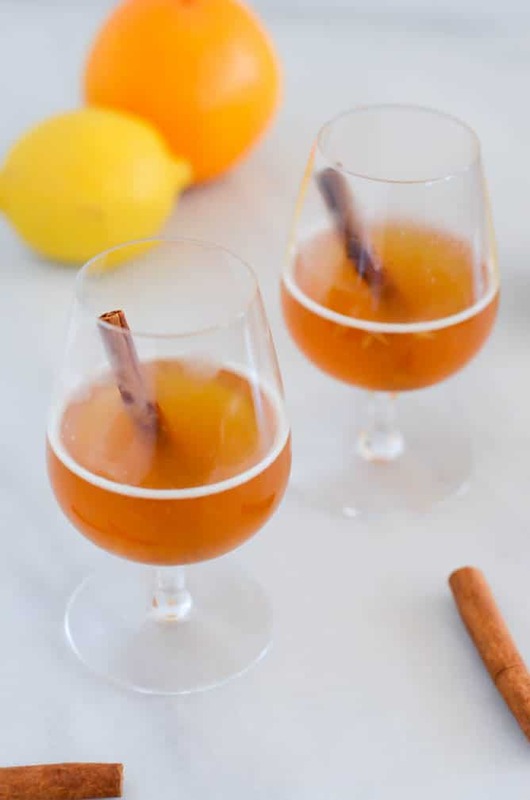 Now, I know I’m sharing this with you before Thanksgiving just in case you’re looking for that perfect way to dress up your turkey a little bit, but in all honesty my Dad usually whips up this recipe for Christmas Eve. In fact, we usually rotate whatever type of poultry we use (sometimes we do chickens, sometimes Cornish game hens, etc.) but The BEST Five-Ingredient Zucchini Stuffing is the one constant on the menu. 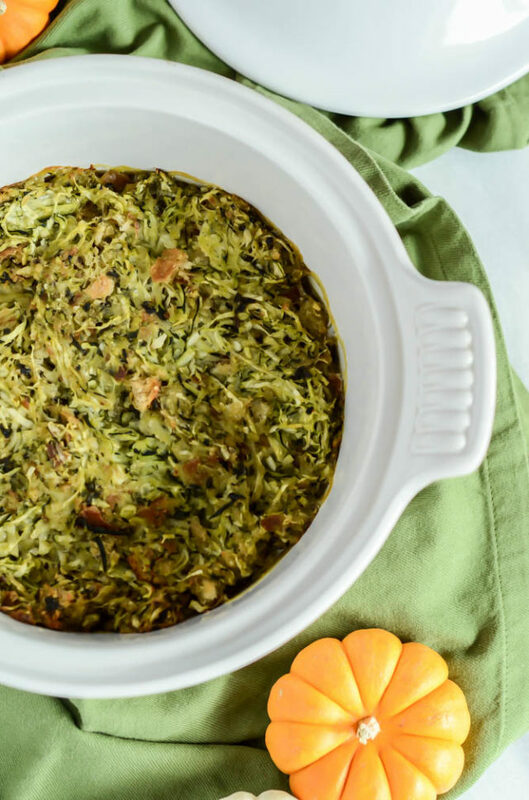 As far as making The BEST Five-Ingredient Zucchini Stuffing, it’s going to be a snap as long as you have a food processor on hand. (But yes, you can also make it without one.) You can use the grater attachment of your processor to grate the zucchini, and the chopper attachment for the basil, breadcrumbs and garlic. After you have all of the ingredients prepped, you’ll sauté the zucchini and garlic in butter, then at the last minute stir in the breadcrumbs and basil before dumping everything into a baking dish (or stuffing it into a bird). If you’re using a baking dish, I might recommend one with a lot of surface area so you maximize the crunchy golden topping, but that’s just me. 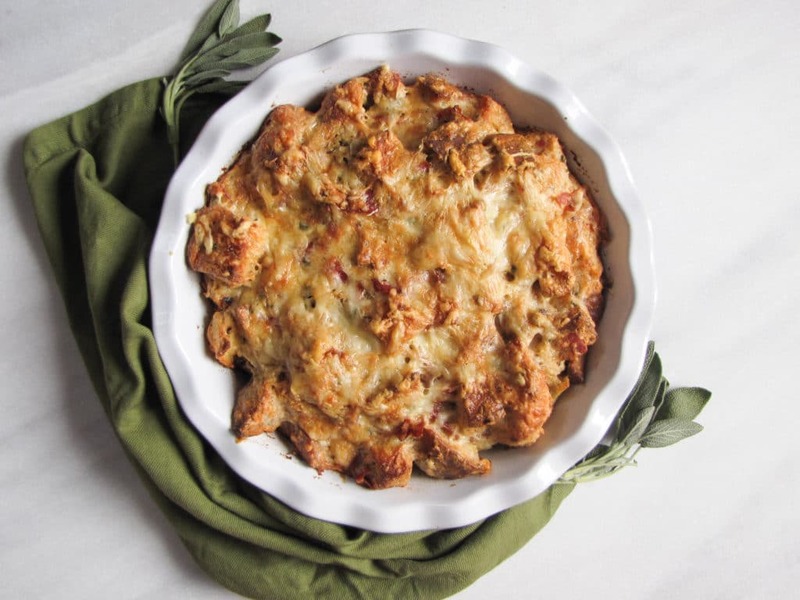 Once you have the stuffing in the oven, it’s very much a “set it and forget it” recipe. 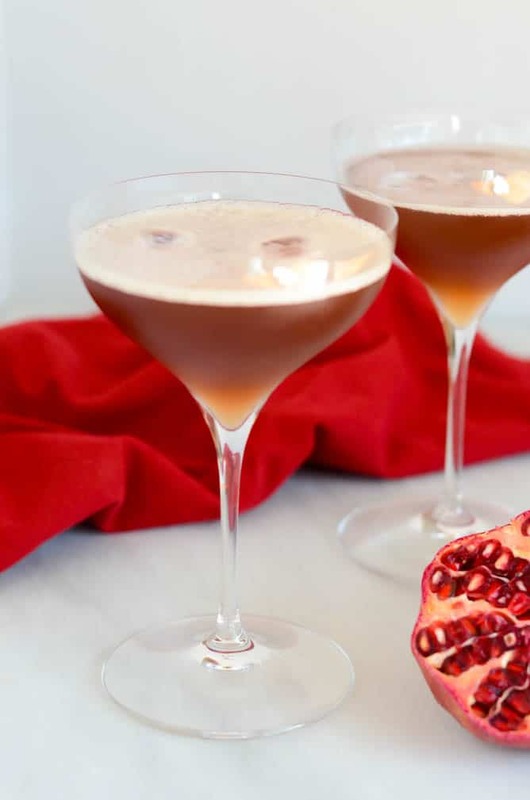 Which means you’ll have plenty of time to sit back and relax with family and friends, hopefully with a delicious cocktail in hand. Because isn’t that what the holidays are REALLY all about?? 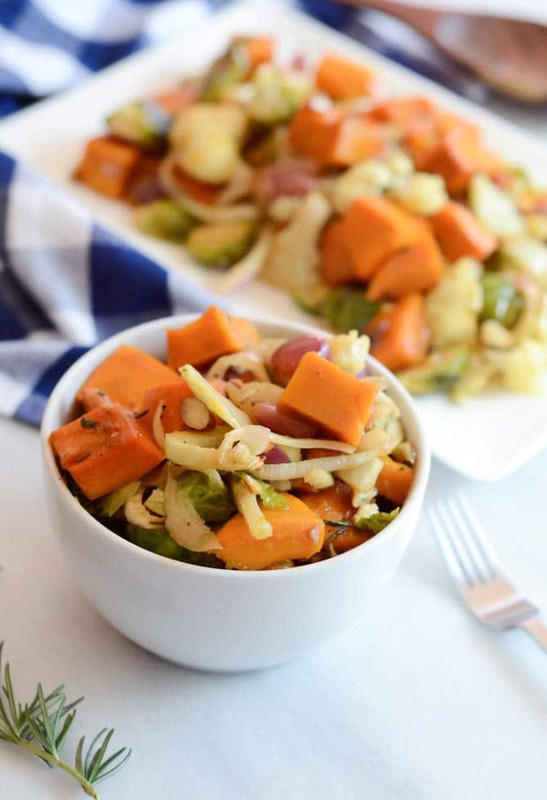 This healthy stuffing recipe is incredibly flavorful with just FIVE ingredients. 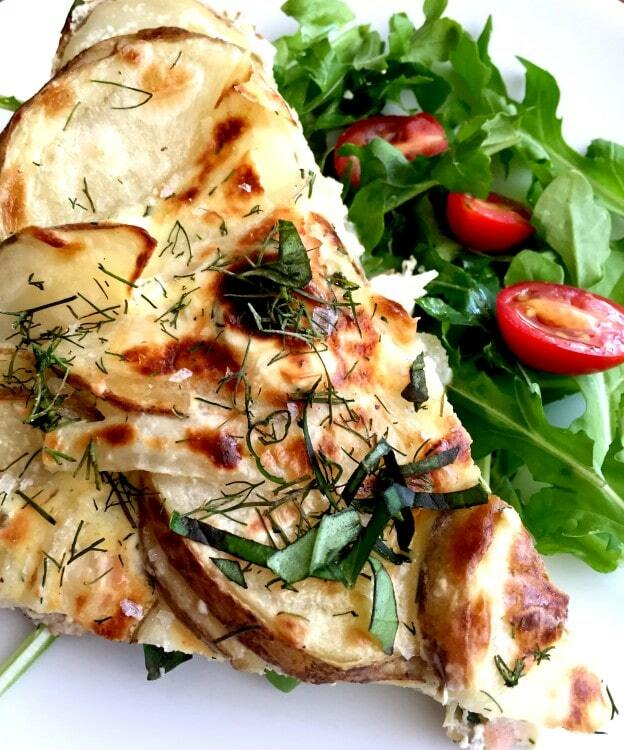 It can be made as a vegetarian side dish or stuffed into a bird! 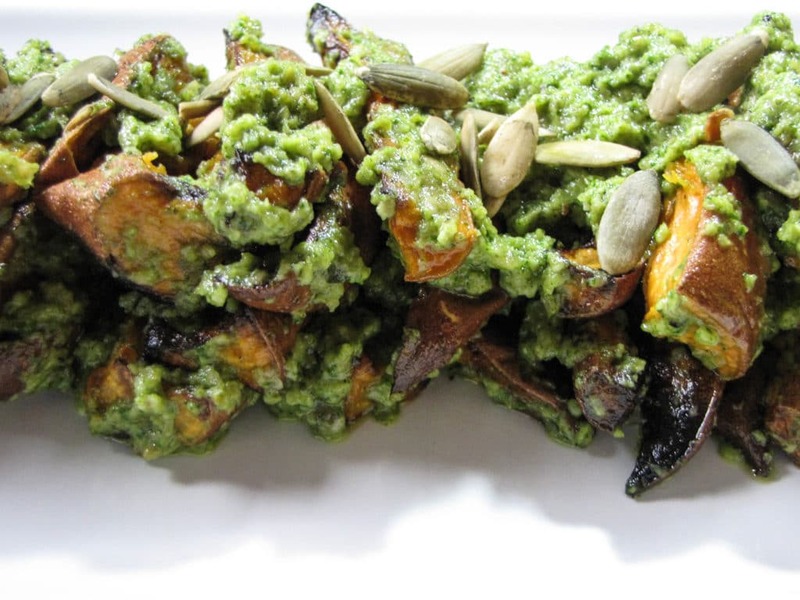 Using the shredding attachment of a food processor or a cheese shredder, shred the zucchini. Squeeze out the excess water using a few paper towels and set aside. Melt the butter in a large sauté pan over medium heat, then add the shredded zucchini and garlic. Sauté until garlic is translucent and fragrant, then turn heat to low. In a clean food processor fitted with the blade attachment, make your fresh breadcrumbs using whatever type of bread you have on hand. Add fresh basil at the very end just to give it a rough chop. Stir breadcrumb mixture into zucchini mixture, then transfer into a baking dish, or stuff into your bird. Bake at desired oven temperature for about an hour, or until the surface of the stuffing takes on a nice golden-brown color. 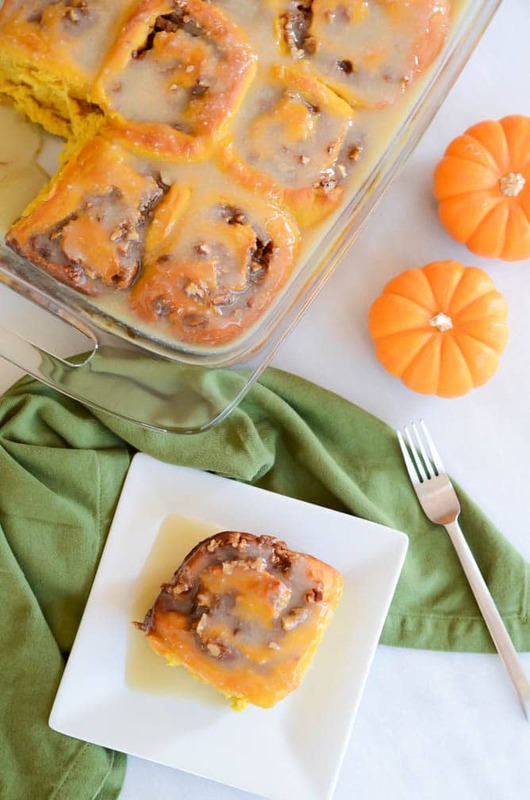 Serve with your holiday meal! We’re stepping a bit outside the Thanksgiving box today. 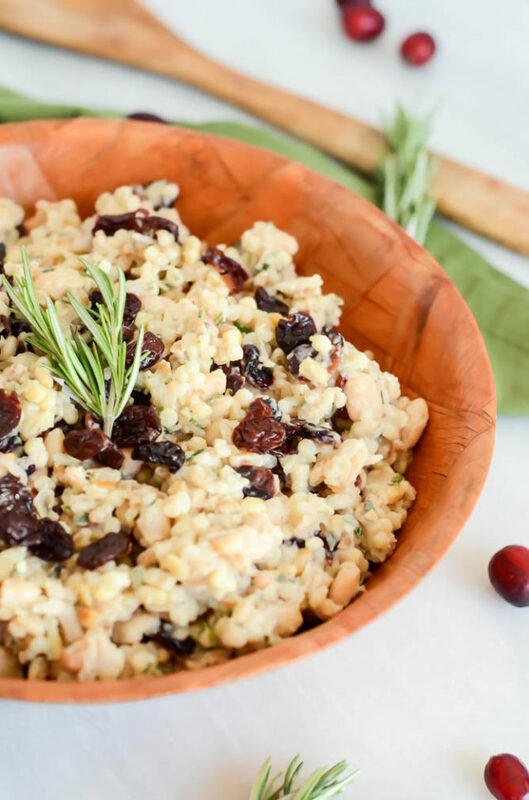 Because, although not a traditional holiday side dish, this Cranberry, White Bean and Grain Salad with Fresh Herbs is completely worthy of a spot on your holiday table. 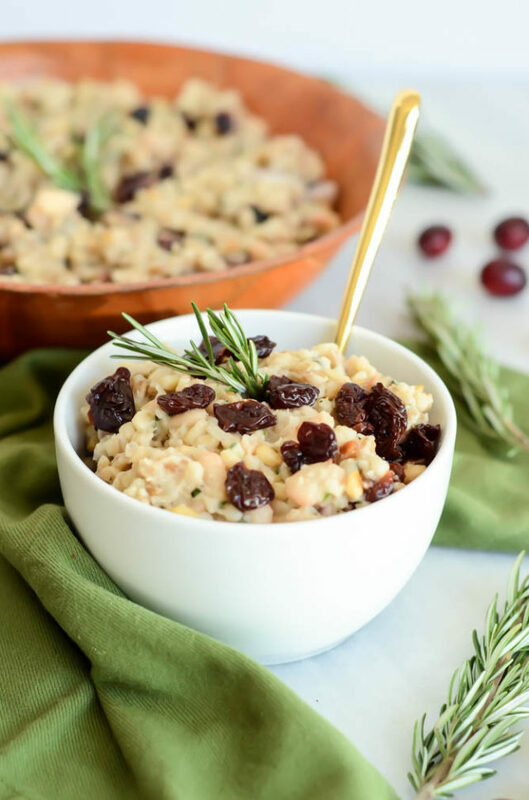 It’s full of dried cranberries, whole grains, white beans and seasonal fresh herbs like fresh rosemary, sage and thyme and literally is a Thanksgiving explosion in your mouth. You’re going to get this one on the menu STAT. I’ve been a big fan of grain salads for quite a while now, as evidenced by this Spring Fava Bean and Burrata Grain Salad, this Fresh Corn, Leek and Edamame Grain Salad and this Herbed Grain Salad with Broccoli Rabe and White Beans. 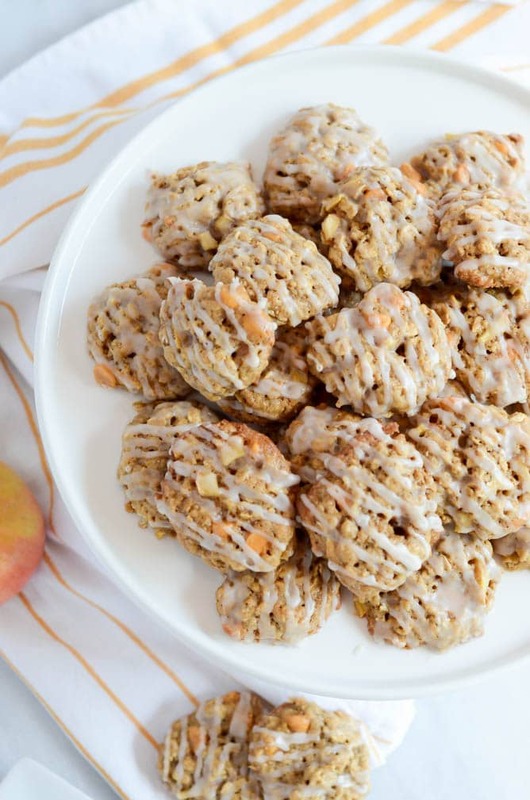 I love them because they are filled with a ton of healthy ingredients and filling to boot. The whole grains give them plenty of heft to make them completely suitable as an entire meal, although they are equally delicious (and the portions go a bit further) if you serve them as a side dish among all the other delicious things you typically serve up for a holiday meal. 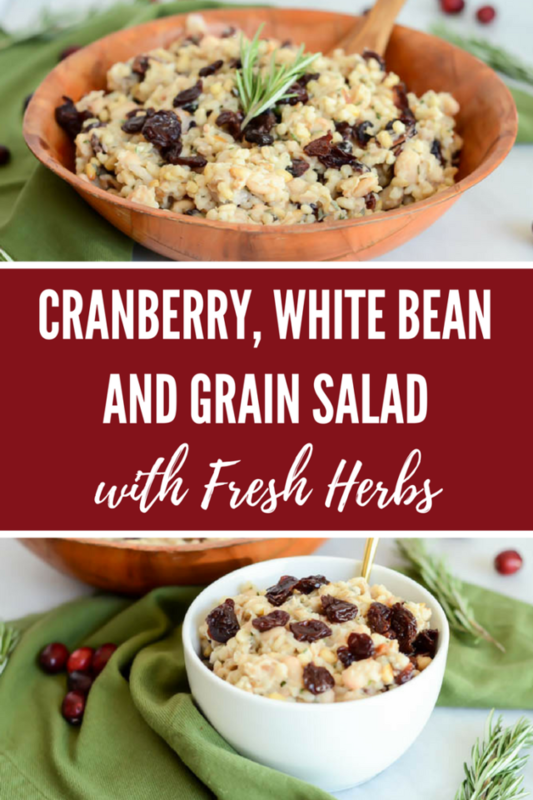 I’m not joking when I say tell you this Cranberry, White Bean and Grain Salad with Fresh Herbs tastes like your entire Thanksgiving menu in a bowl. 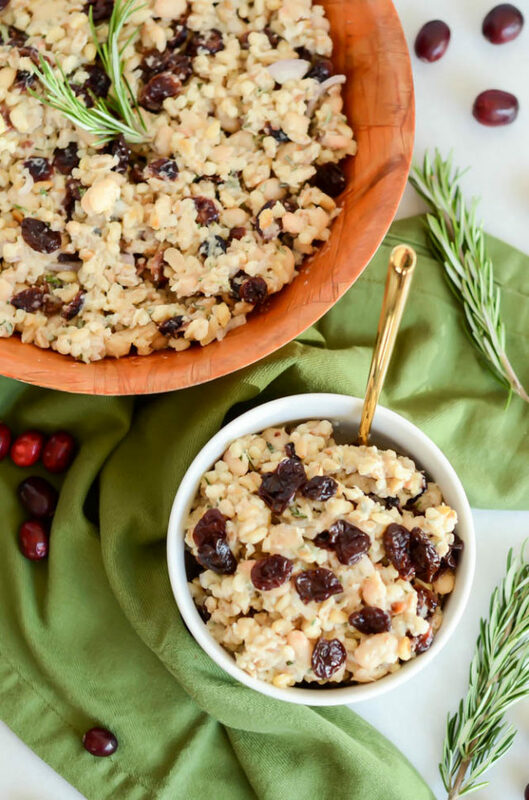 Sure, there’s no turkey in there (although you could easily add some and I wouldn’t be one bit upset about it) but just the cranberries and the fresh herbs alone are enough to mentally transport you to arguably the most well-known food holiday of the year. 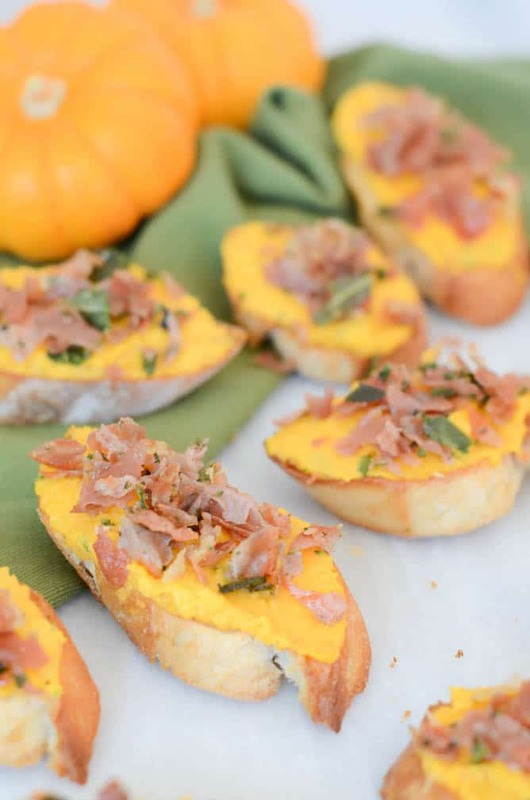 I love allll the fresh herbs, but there’s also just something about fresh sage in a recipe that really screams fall and all the deliciousness that comes with it. As far as making the dish goes, it couldn’t be easier. Not only does it come together fairly quickly (the longest step will be cooking up the grains) but it can also be made in advance and served cold or at room temperature, which means it’s easy to fit into an already busy cooking and kitchen schedule once T-day rolls around. 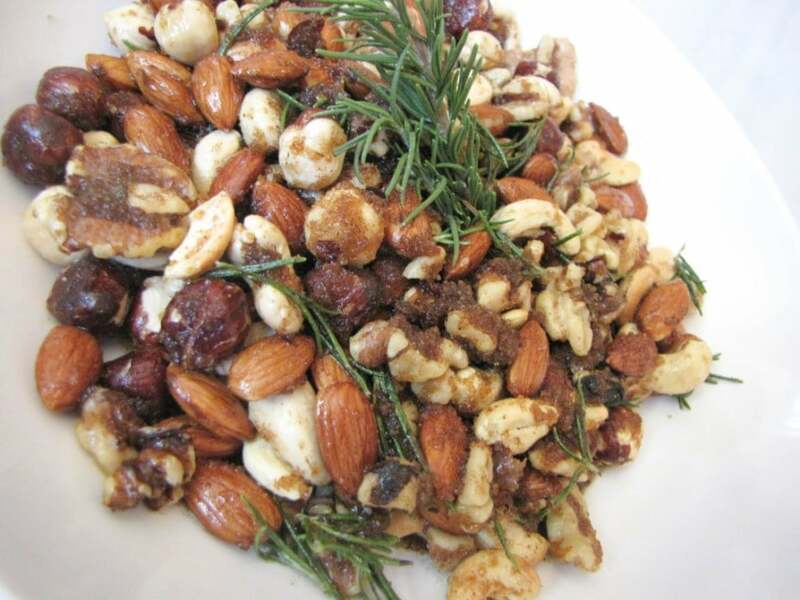 I would also like to point out that said Cranberry, White Bean and Grain Salad with Fresh Herbs is completely vegan, which makes it a delicious, healthy, high-protein option for anyone in your group that may have certain dietary preferences. 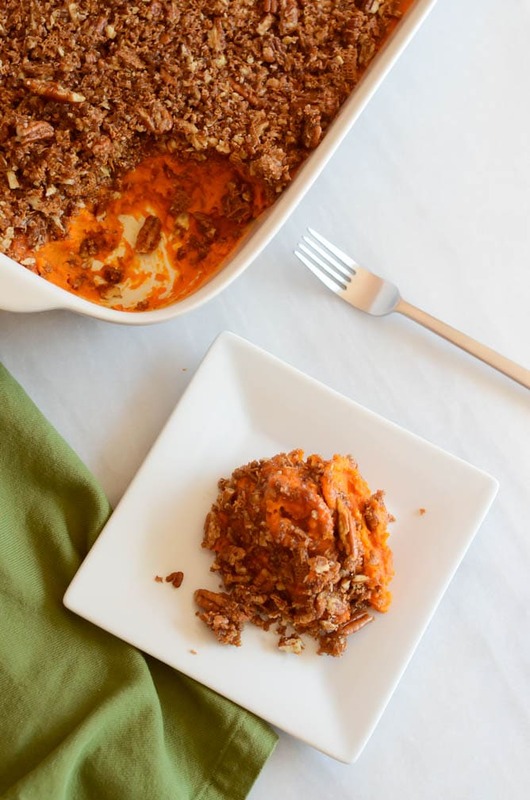 It’s a great way to serve them up some protein and filling flavor without having to bend over backwards making some sort of interesting Tofurkey creation. Since I was developing recipes so far in advance this holiday season due to our little one’s arrival, I served this up as a side dish at my mother-in-law’s birthday celebration we held down here in Santa Barbara at the beginning of October. Let’s just say my sisters-in-law were already requesting I make it as our contribution to the Thanksgiving meal when we go celebrate with them in a couple of weeks. I hope you decide to add it to your menu as well! This festive vegan side dish is full of filling whole grains, protein-rich white beans and pine nuts, and the freshest herbs of the season. 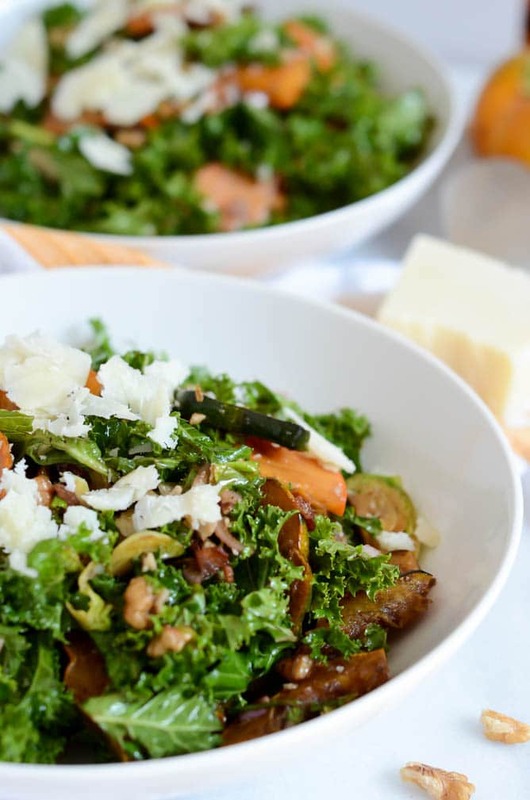 Toss all ingredients together in a large bowl. 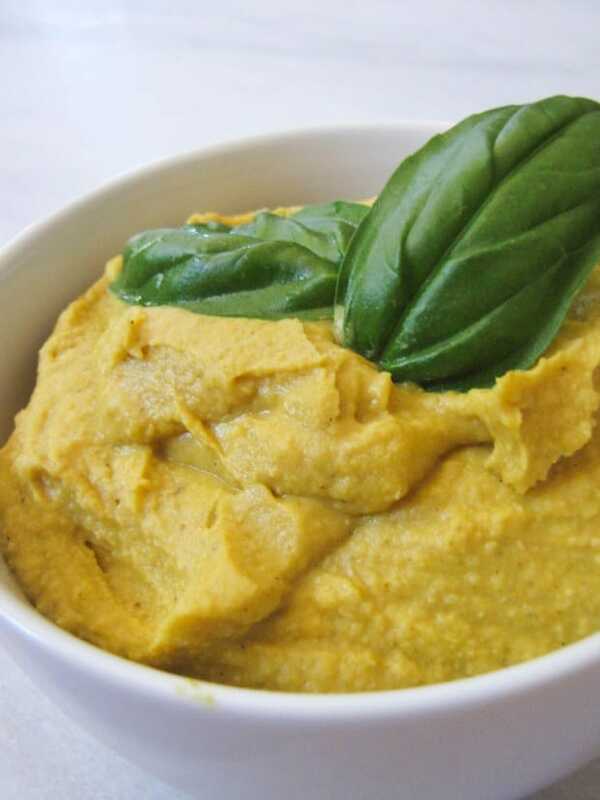 Serve immediately or refrigerate up to two days before serving. Are we ready to think about something other than turkey yet? I know, I know, I’m jumping the gun a bit seeing as Thanksgiving isn’t until tomorrow, but I bet you’ve already got the prep of your bird well under way, potatoes ready for mashing, and pumpkin pies baking in the oven. Time to start thinking about meals for the rest of the weekend, am I right? We all know that the eating frenzy that is known as Thanksgiving does not end on Thursday night. No, no, no, it runs straight through Friday, Saturday and Sunday, whether you’re crazy enough to hit the Black Friday sales or digging out your Christmas decorations. 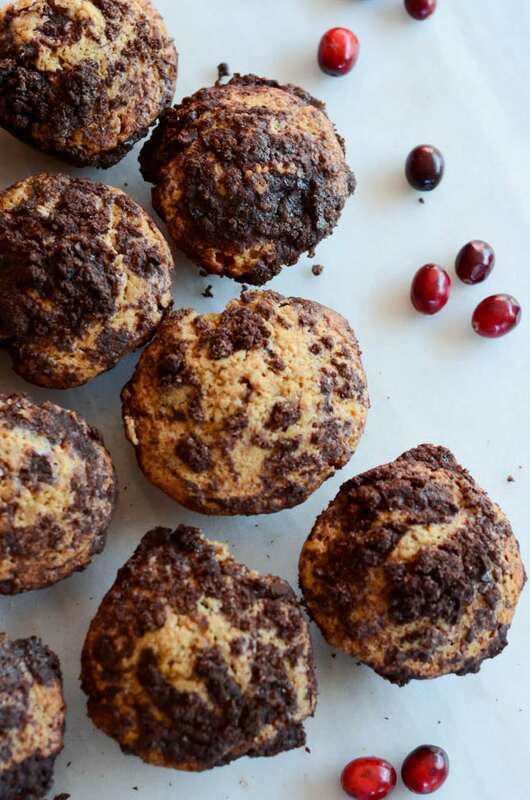 Which is why we need something like these Cranberry Chocolate Chunk Muffins with Chocolate Streusel in our arsenal. 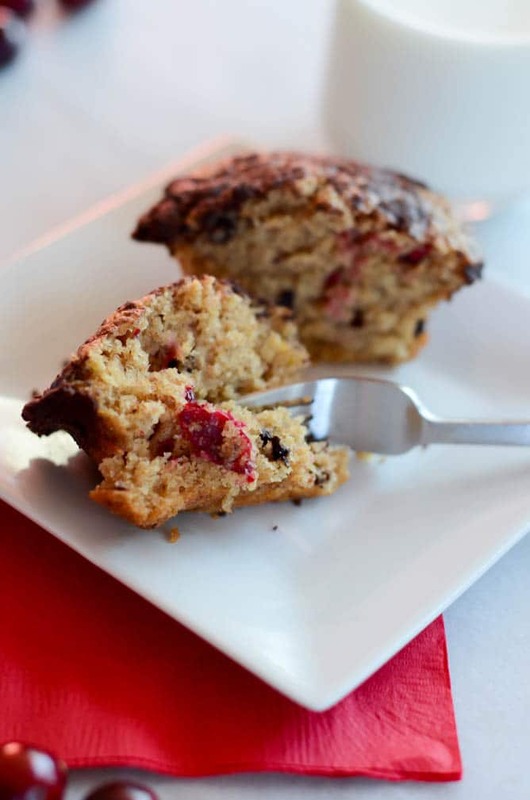 A quick, easy, tasty breakfast loaded with a double dose of chocolate? I like it. I like it a lot. We’re heading up to the Bay Area tonight, so I’ve spent the last couple of days cooking up whatever we’d be able to transport easily. The hubs and I are lucky that we can drive to our Thanksgiving destination, so we usually load a cooler or two in the car with treats that we’ve made to help take some of the cooking pressure off of our parents. 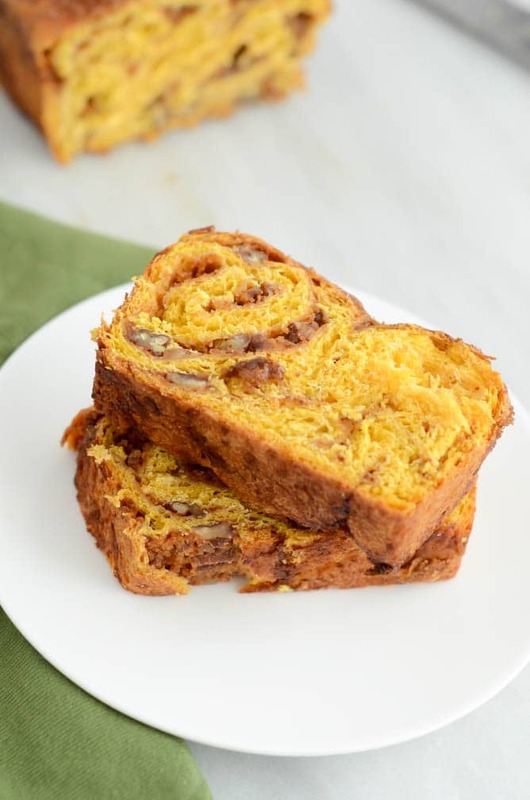 This time around, I’m bringing up some Sweet Potato Casserole Babka, a delicious Pumpkin-Walnut Pate I just whipped up (recipe coming to the blog soon! ), Jessica’s White Cheddar, Toasted Almond and Crispy Sage Cheese Ball, and of course some of these Cranberry Chocolate Chunk Muffins with Chocolate Streusel! Let me tell you a little bit about these muffins, because they are (sing it with me) “FAAAB-U-LOUSSS! !” They also happen to be the very first muffin recipe I’ve posted on this here blog. Can you believe it? I can’t, seeing as muffins (specifically, muffin tops) are one of my favorite types of baked goods. I kid you not, I’m that gal who will go buy a muffin strictly for its huge, crunchy top and discard the rest. My own special kind of balance, I guess? 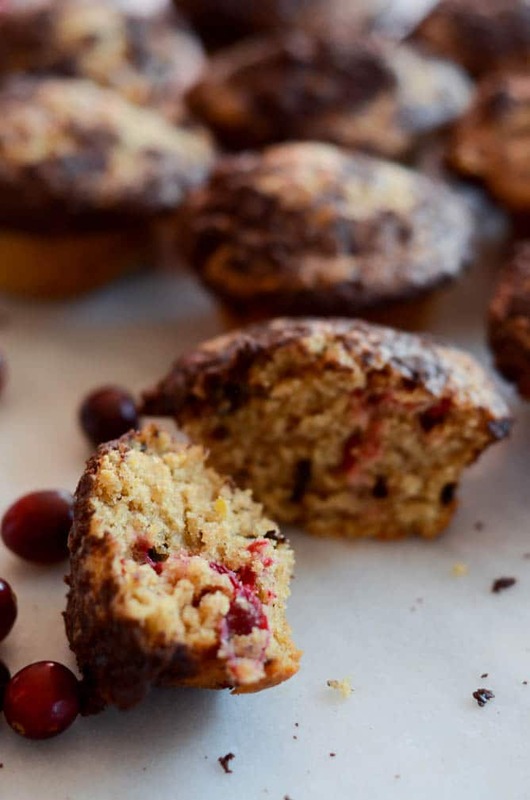 The great news about these muffins, though, is that you are going to want to eat the whole. entire. thing. How can you not when they are laced with huge chocolate chunks, fresh cranberries, and an oh-so-perfect hint of orange? 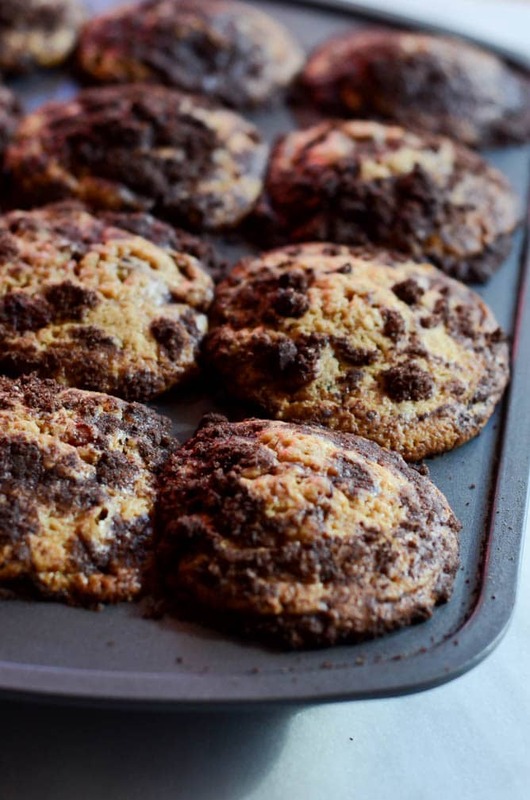 Um, yea, did I mention they’re also topped with the crunchiest, chocolatey-est chocolate streusel of all time? Quick confession: I actually used the chocolate streusel recipe from this Pumpkin Chocolate Crumb Cake by Hungry Girl Por Vida, and just cut it in half to use on the muffins. I’ve made this Crumb Cake two years in a row (a rare feat in the life of a food blogger) and it is soooo delicious. I especially love that it involves both cocoa powder AND chocolate chunks, so you get a double dose of that rich flavor. I knew it would be the perfect accessory for muffins already laced with chocolate chunks and cranberries. 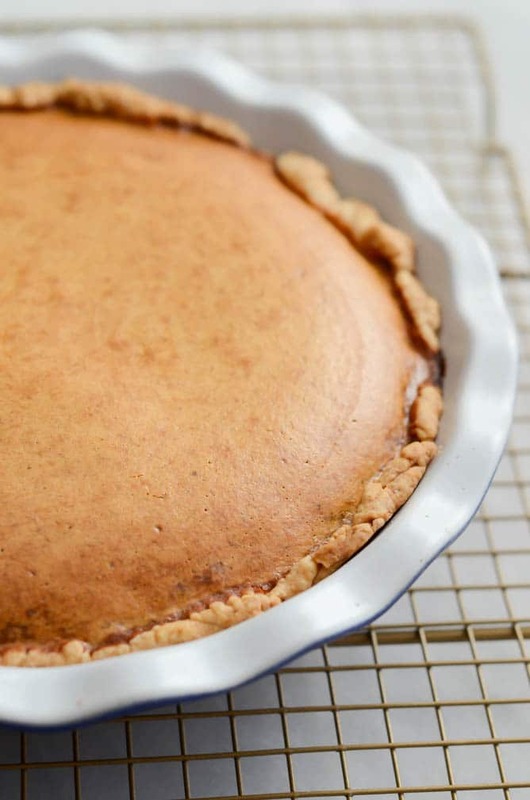 The batter comes together quickly and easily, with all of the basic ingredients. 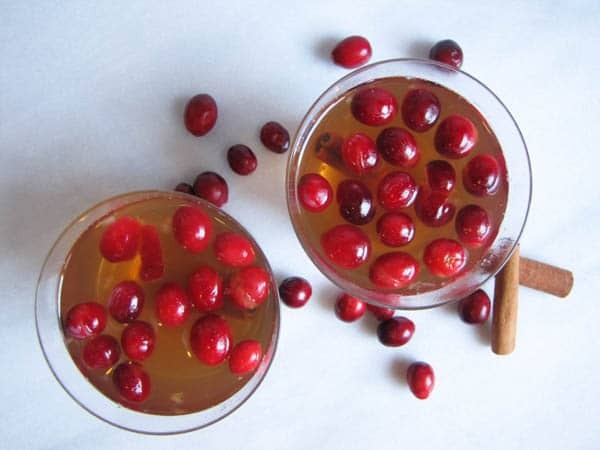 And although I used fresh cranberries in this recipe, you could easily sub in frozen, as sometimes those are a bit easier to come by. 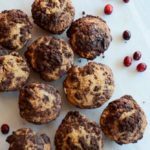 These Cranberry Chocolate Chunk Muffins with Chocolate Streusel are truly so delicious and the perfect precursor to a day of chopping down your Christmas tree or watching football and chowing on leftovers. They’re also the perfect way to segue into the Christmas season, because Christmas means all things cranberry and chocolate, right? One final note: these muffins are perfect candidates for a little freezer action. Just be sure to freeze them in a solid container (and then transfer to something like a Ziploc if necessary afterwards) so as not to lose all of that delicious chocolate crumble on top! 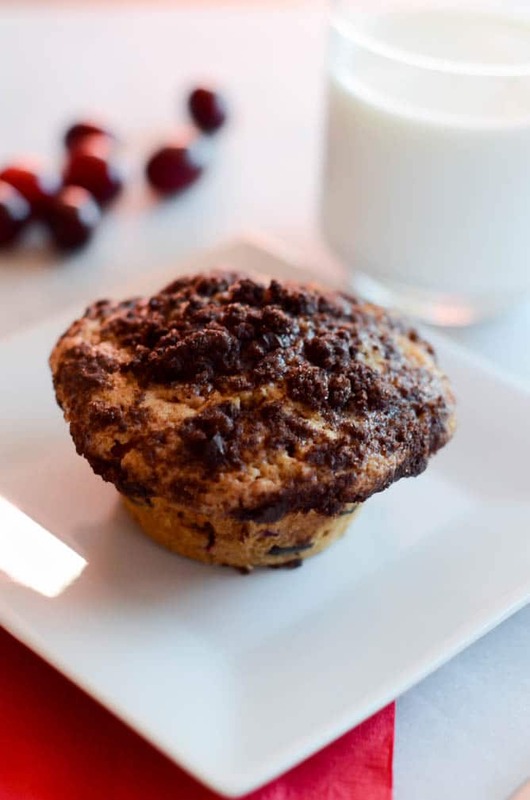 A festive muffin for holiday breakfasts, loaded with chocolate chunks, fresh cranberries and topped with a double chocolate streusel! First, make the chocolate streusel. In a small mixing bowl, combine all streusel ingredients. Blend using fingers (or a pastry blender) until mixture resembles wet sand and butter is at least in pea size chunks. Set aside. Preheat oven to 350 degrees Fahrenheit. Line a 12-cup muffin tin with liners or spray with cooking spray and set aside. Using a stand mixer fitted with the paddle attachment, cream the butter and both sugars together until mixture is light and fluffy, about 2-3 minutes. 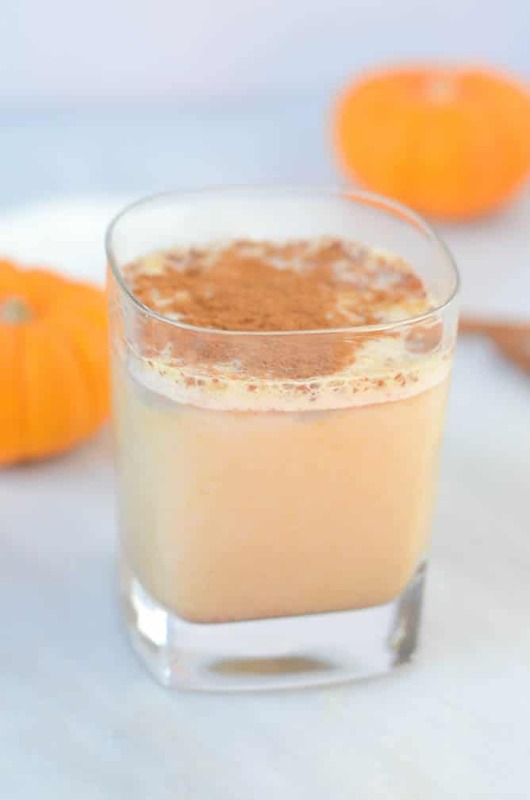 Slowly add in the eggs, milk, vanilla and orange zest until well combined. Set aside. In a medium mixing bowl, whisk together the flours, baking powder, spices and salt. Add these dry ingredients to the wet ingredients in the stand mixer and mix on medium speed until combined. Gently fold in the cranberries and chocolate chunks. Scoop batter into prepared muffin tin, filling each cup about ¾ of the way up. Top each muffin with a generous amount of streusel. Bake in 350 degree oven for 23-25 minutes, or until a toothpick inserted into the center of the muffins comes out clean. Let cool for 10 minutes in pan before turning out onto a rack to cool completely. Streusel recipe from Hungry Girl Por Vida’s Pumpkin Chocolate Crumb Cake. Breakfast never looked so good. Folks, we’re just three short days away! Yes, just three short days away from completely indulging in all of these foods we’ve been anxiously anticipating for the last, oh, two months? 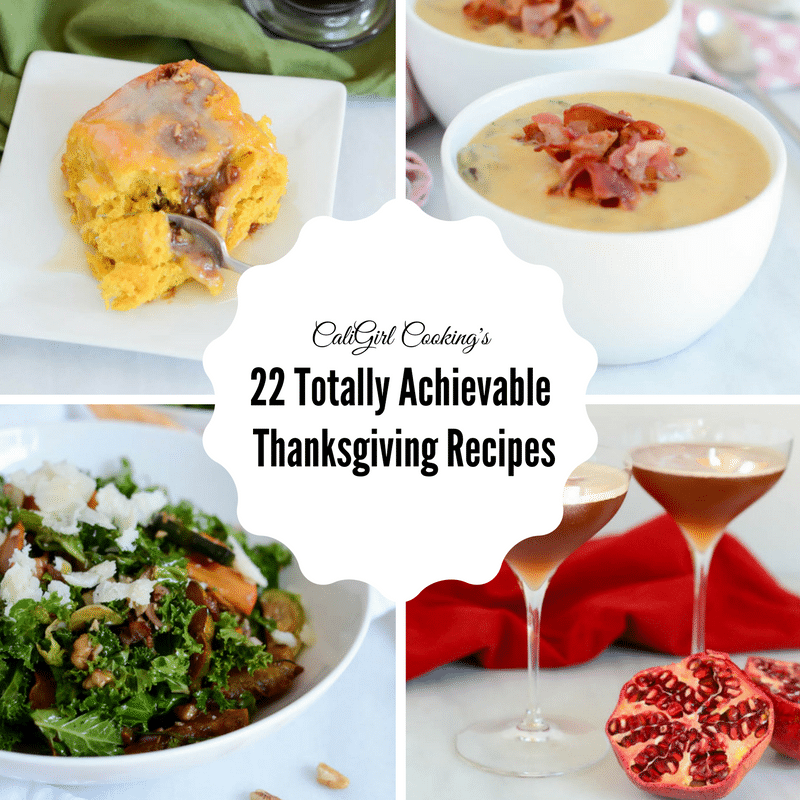 Turkey, cranberries, stuffing, potatoes, sweet potatoes, pie…oh man I cannot wait! 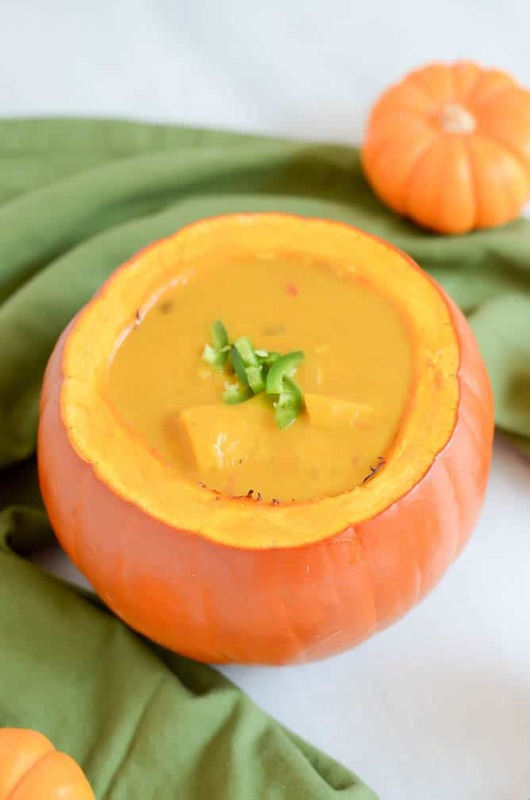 So to build up the anticipation even MORE (and because I was busy goofing off/working in Napa for most of last week instead of slaving away in the kitchen,) today I’ve put together some of my favorite CaliGirl Cooking recipes that would be perfect additions to your Thanksgiving weekend menu(s). Because we all know that the eating doesn’t stop on Thursday, right? 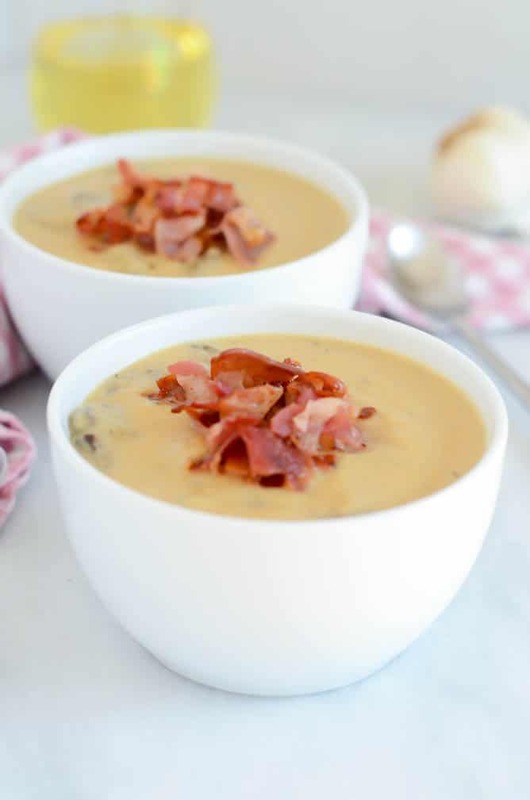 And friends, as the title of this post states, all of these recipes are perfectly achievable, especially when you’re in the kitchen with all of your loved ones. There’s nothing quite like whipping up a delicious dish and coming together over the dinner (or breakfast, or lunch) table to devour it together.